An interesting paper in « Case study in Engineering Failure Analysis » published on ScienceDirect.com. This paper analyzed why a compression coil spring fractured at the transition position from the bearing coil to the first active coil in service, while the nominal stress here should always be much less than that at the inside coil position of a fully active coil. 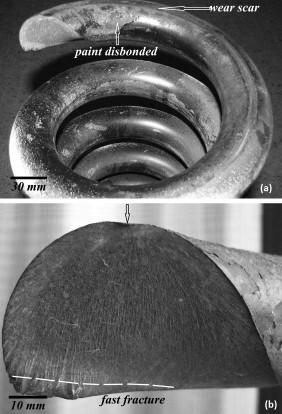 Visual observations indicated that a wear scar was formed on the first active coil and the fracture surface showed radiating ridges emanating from the wear scar. Scanning electron microscopy examination showed crescent shaped region and beach marks, typical of fatigue failure. ZnCaph phosphate layer and painting around the contact zone were worn out due to contact and friction and resulted in corrosion and corrosion pits induced local stress concentration. Stress analysis indicated severe stress singularities at the edges of the contact zone, which facilitated cycle slip and fatigue crack nucleation. Recommendations were also made for improving the fatigue performance of the suspension springs. Ce contenu a été publié dans Publications par geraldb17, et marqué avec cas concrets, case study, Coil spring, Contact, corrosion, fatigue failure, Fretting Wear, spring, Wear. Mettez-le en favori avec son permalien.